We’d love your help. Let us know what’s wrong with this preview of The Kingdom Under the Sea and Other Stories by Joan Aiken. A collection of eleven fairy tales from eastern Europe and the Soviet Union retold by a noted English author. To ask other readers questions about The Kingdom Under the Sea and Other Stories, please sign up. Çok güzel bir öykü kitabıydı. İçerisindeki hikayeler birbirinden değişikti ve her hikayenin sonunda mutlaka çıkarılması gereken bir ders içeriyordu. İleride -uzun uzun yıllar sonra- çocuğum olursa ve 9-12 yaş arasındayken bu kitabı -tabii o zaman elimde bir nüshası olmuş olur umarım ve ebook olarak okutmam- okumasını isterim. Bu arada kitabın içindeki 11,on bir hikayeden en çok beğendiklerim; Denizin Dibindeki Krallık,Sazlıkta Yaşayan Kız ve Armut Ağacı oldu. Kitapla ilgili daha uzun yorumumu okumak Çok güzel bir öykü kitabıydı. Yazarın daha önce Uyurgezer Ayı kitabına hevesle başlayıp hayalkırıklığıyla kapağını kapatmıştım. Bu kitabı bulduğumdaysa yine bir heyecanla başladım ama buraya güncelleme girene kadar aynı yazar olduklarını fark etmemiştim bile. Sonra bir kendimden şüphe ettim, Allah var, o kitabı da yanlış zamanda okuyup ziyan etmiş olabilir miyim, diye. Gerçekten içinde çok hoş hikâyeler vardı, yavaş yavaş ve keyifle okudum. “Tanrı onları korur!” diyen kız koşa koşa köyüne dönmüş. İşte bu yüzden Peter çayırda kalıp kazlara bakmak zorunda kalmış. Bir daha da Tanrı olmak istememiş. 2.75. It was lovely to come back to this book. I remember a haze of memories of reading my mother’s copy in my early childhood and these stories were so absurd, so imaginative that reading them again gives me waves of nostalgia. They are ludicrous in the best way, and though they aren’t my usual reading material, I enjoyed them nonetheless. An absolutely wonderful book i loved in my childhood and still have a copy. The illustrations make it complete and one of my all time favourites. Kept this one after removal from stock just because I thought the art was neat. It's a pleasant enough collection for what it is. Hmmm... saya belum nge-review buku ini ya. Gimana ya...? Hmmm... sebagai seorang fans yang "jatuh cinta pada pandangan pertama" dengan Joan Aiken di buku A Necklace of Raindrops, saya merasa agak 'jomplang' dengan buku ini. Oh iya, saya belum pernah baca buku Aiken selain Raindrops dan ini, jadi mungkin saya kurang pengetahuan tentang beliau juga makanya kaget. Tapi, menurut saya--dari review-review yang saya baca selama ini--The Kingdom Under the Sea ini memang "spesial". Buku ini bukan cerita-ce Hmmm... saya belum nge-review buku ini ya. Tapi, menurut saya--dari review-review yang saya baca selama ini--The Kingdom Under the Sea ini memang "spesial". Buku ini bukan cerita-cerita orisinal Aiken, melainkan saduran dari mitos-mitos yang ada di dataran Eropa. Makanya, perasaan 'jomplang' yang saya alami ini (mungkin) wajar. Buku ini banyak berisi tokoh-tokoh yang mati (dan dengan cara yang sadis pula!!!) khas cerita mitos. Di Indonesia pun begitu, bukan? Mitos yang tersebar di masyarakat kebanyakan nakut-nakutin, cenderung mirip cerita horor yang dibungkus embel-embel "legenda". Demikian pula cerita-cerita di buku ini. Isinya serem (menurut saya). Ada putra yang mencoba membunuh ayahnya sendiri demi menggapai cita-cita mereka masing-masing, ada satu keluarga yang ngurung menantu perempuannya idup-idup di dalam menara, Raja dan Ratu super licik, dan lain-lain. Dibandingkan Raindrops, ilustrasi Pienkowski di sini lebih banyak dan lebih terasa "fairytale-ish". Saya suka ngeliatin rumput-rumputnya (yang entah napa di mata saya terlihat beda satu sama lain! Cuma rumput padahal!!! ), padahal gambarnya kan siluet gitu tapi bener-bener bisa tampak indah dan "bercerita". Dikau ngeliatin gambarnya aja tuh udah berasa langsung ngerti ceritanya gimana. Meski gak ada gambar wajahnya (karena--saya ingatkan lagi--cuma siluet), pembaca seolah bisa ngebayangin ekspresi masing-masing tokoh. Varför ska jag bli så lättuttråkad av korta historier? Tyvärr blev det så här också. Ofta kände jag det som att sagorna inte var färdiga, vilket är helt absurt – dessa berättelser har ju förts vidare från generation till generation och borde hunnit bli utförligt uttänkta för länge sedan… Kanske är det så enkelt att dessa sagor och berättartraditioner skiljer sig från det jag är van vid och kanske är det därför jag blir konfunderad. Jag vet inte. Men illustrationerna är ändå tjusiga och gör att b Varför ska jag bli så lättuttråkad av korta historier? Tyvärr blev det så här också. Ofta kände jag det som att sagorna inte var färdiga, vilket är helt absurt – dessa berättelser har ju förts vidare från generation till generation och borde hunnit bli utförligt uttänkta för länge sedan… Kanske är det så enkelt att dessa sagor och berättartraditioner skiljer sig från det jag är van vid och kanske är det därför jag blir konfunderad. Jag vet inte. Men illustrationerna är ändå tjusiga och gör att betyget landar på en svag trea istället för en tvåa. This is a beautifully illustrated retelling of some East European myths. I love the internal logic of myths and legends, and the matter of fact acceptance of some very strange goings on. I'd already read some of the book before I realised that Jan Pienkowski was the illustrator of the Meg and Mog books which were my favourites as a child and are now some of my daughter's. The style is completely different here; the picture of the Sun God's castle is truly charming. This book is a real gem. It is beautifully illustrated by the wonderful Jan Pieńkowski. I love fairy stories and this is well researched and edited to reflect a range of cultures and ideas. Perfect. Surely read it as a child but don't remember - found a tatty old copy at work and spent a happy evening re-visiting these traditional and unusual tales. I read these stories to my daughter, and she tells me she read them over and over again herself afterwards. She also adored the illustrations. Now the grandchildren have had the pleasure of hearing them, and they also loved looking at the pictures. How lovely it is to be able to share beautiful books with more than one generation! 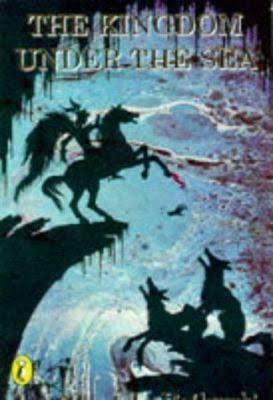 Joan Aiken is a skilled writer, and has told these Eastern European folk tales in a manner well suited to today's children. More incredible illustrations by Jan Pienkowski. These were good tellings, but I have to point out that Aiken's original stories in Necklace of Raindrops and Other Stories are fantastic; between the two collections, I would recommend reading the latter. The illustrations are the most stunning part about this fairy-tale collection. I do have to admit that even as an adult I often didn't understand the outcomes of the stories. Perhaps they are edited down and therefore end abruptly. Somehow there wasn't the nostalgic wonder I was expecting. A superb set of myths, beautifully retold by Joan Aiken. Jan Pienkowski's style is perfect for the tone of the storytelling, and together they bring the tales to magical life. An excellent introduction to Eastern European legends and tales for any child - my 5-year old son loved it. I'm going to try to scan in a couple of pages - the frontspiece at the very least - when I get a chance, but the artwork is absolutely gorgous. As a sneak preview, check out Aerin's review. This book had many interesting tales that have lots of magic in them that make you read the book till the end without putting it down, I loved this book! Wonderful, old fashioned fairy tales with gorgeous illustrations. A captivating collection of fairy tales that I have loved since I was very young and often re-read. Bu seferkiler biraz daha sıkıcı. Ama hakkını vermek lazım, kadın yaratıcı..
A beautifully written collection of stories with haunting illustrations by Jan Pienkowski. It was one of my favourites as a child and I still love it. Four stars for the stories, six stars for the illustrations. Pienkowski's work is jaw-dropping amazing! A classic book of fairy tales from other countries. Beautiful silhouettes illustrate the stories. My favourite has always been the tale of Baba Yaga. Joan Aiken was a much loved English writer who received the MBE for services to Children's Literature. She was known as a writer of wild fantasy, Gothic novels and short stories. She was born in Rye, East Sussex, into a family of writers, including her father, Conrad Aiken (who won a Pulitzer Prize for his poetry), and her sister, Jane Aiken Hodge. She worked for the United Nations Information Offi Joan Aiken was a much loved English writer who received the MBE for services to Children's Literature. She was known as a writer of wild fantasy, Gothic novels and short stories. She was born in Rye, East Sussex, into a family of writers, including her father, Conrad Aiken (who won a Pulitzer Prize for his poetry), and her sister, Jane Aiken Hodge. She worked for the United Nations Information Office during the second world war,and then as an editor and freelance on Argosy magazine before she started writing full time, mainly children's books and thrillers. For her books she received the Guardian Award (1969) and the Edgar Allan Poe Award (1972). Her most popular series, the "Wolves Chronicles" which began with 'The Wolves of Willoughby Chase', was set in an elaborate alternate period of history in a Britain in which James II was never deposed in the Glorious Revolution,and so supporters of the House of Hanover continually plot to overthrow the Stuart Kings. These books also feature cockney urchin heroine Dido Twite and her adventures and travels all over the world. Another series of children's books about Arabel and her raven Mortimer are illustrated by Quentin Blake, and have been shown on the BBC as Jackanory and drama series. Others including the much loved 'Necklace of Raindrops' and award winning 'Kingdom Under the Sea' are illustrated by Jan Pieńkowski. Her many novels for adults include several that continue or complement novels by Jane Austen. These include 'Mansfield Revisited' and 'Jane Fairfax'.